The Zamberlan Trek Lite boots first entered my life in mid-1999. I was post-divorce, post-business flame-out and after several years of not doing much of anything outdoors I’d agreed to do the West Coast Trail and had to outfit myself quickly, as well as start actually hiking again. Little did I know at the time how many changes in my life they’d see me through. 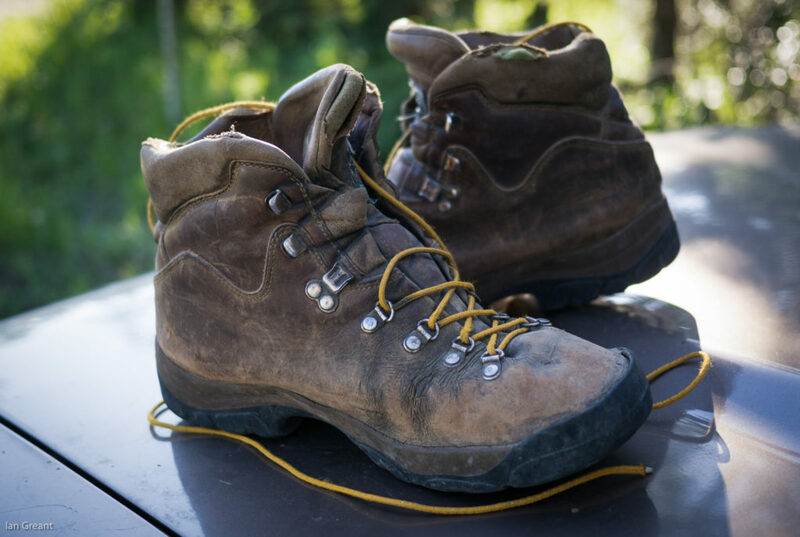 I was a teenager the last time I’d done any backpacking and I’d never even owned a serious pair of backpacking boots, so choosing a good boot was a pretty daunting task but the staff at Mountain Equipment Co-op gave me solid advice. The next day I was hitting the local trails and, as I recall, the break-in period was fairly painless, even for someone with feet as oddly-shaped as mine. The West Coast Trail was a life-changing experience that firmly put me back on the road to outdoor adventure and the boots served me very well. Despite my inexperience and long period of inactivity they carried me through rocky beaches, down muddy trails and over slippery moss-covered wooden ladders. Over the years there have been more hikes, scrambles, snowshoes and even climbs than I can remember or possibly count. Durability. In the time I’ve had my boots the popularity of synthetic boots has dramatically risen and few of my friends use old fashioned leather boots but most of them have been through several pairs of new-style boots in the time I’ve had the Zamberlan’s. Comfort. Leather may require some breaking in but once they are broken in, the comfort is unbeatable. I jokingly refer to my boots as “slippers” since they are that comfortable. Sticky, Durable Soles. The Vibram Tahoe soles are nothing short of amazing. I’ve climbed a lot of low 5th class in them and once, when I forgot a climbing shoe, I climbed an 8 pitch 5.7 route with a boot on one foot and a climbing shoe on the other. Based on my experience I highly recommend the Zamberlan product. If the design of their last hasn’t changed they will still be a good choice for people with wider feet, or high arches. What will I replace these with? At this point I’m not yet sure but I know for sure that I will be testing a new pair of Zamberlan’s. The 996 VIOZ GTX looks intriguing due to its traditional leather construction combined with a higher performance sole. However I probably couldn’t go wrong in choosing the 309 NEW TRAIL LITE GTX which appears to be the modern successor to the boots I’ve loved for so long.